The benefits of marketing through the Multi Keys network are many, not least the fact it is an extremely well trafficked network. In addition, a listing on any of the network's sites will improve your own web site's rankings in Google , Bing! Yahoo! and all other major search engines. 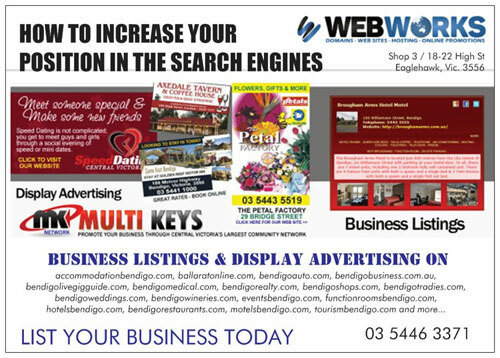 Every Bendigo business is given a free listing on the Multi Keys network with the option to upgrade to an enhanced or premium listing. An enhanced business listing includes up to 40 words to describe the business. Enhanced listings cost $120 + GST annually. Premium listings include a longer 200 word description of the business, a business logo, links to a website, twitter, youtube and facebook. Premium listings cost $180 + GST annually.